For millinery fashion, see Draped turban. For other uses, see Turban (disambiguation). Harjit Singh Sajjan, the Minister of National Defence of Canada wearing a Sikh turban. The turban is one of the most recognized symbols of the Sikh community. A turban (from Persian دولبند‌, dulband; via Middle French turbant) is a type of headwear based on cloth winding. Featuring many variations, it is worn as customary headwear by people of various cultures. Communities with prominent turban-wearing traditions can be found in the Indian subcontinent, Southeast Asia, the Arabian Peninsula, the Middle East, Central Asia, North Africa and the Horn of Africa. Wearing turbans is common among Sikhs, including women. The headgear also serves as a religious observance, including among Shia Muslims, who regard turban-wearing as Sunnah Mu'akkadah (confirmed tradition). The turban is also the traditional headdress of Sufi scholars. Additionally, turbans have often been worn by nobility, regardless of religious background. They are also sometimes donned to protect hair or as a headwrap for women following cancer treatments. The origins of turbans are uncertain. Some of the ancient civilizations such as those of Ancient India, Mesopotamia, Sumerian and Babylonian evidently used turbans. A style of turban called a phakeolis continued to be worn in that region by soldiers of the Byzantine army in the period 400–600, as well as by Byzantine civilians as depicted in Greek frescoes from the 10th century in the province of Cappadocia in modern Turkey, where it was still worn by their Greek-speaking descendants in the early 20th century. The Islamic prophet, Muhammad, who lived 570–632, is believed to have worn a turban in white, the most holy colour. Shiah clergies today wear white turbans unless they are descendants of prophet Muhammad or Sayyid, in which case they wear a black turban. Many Muslim men choose to wear green, because it represents paradise, especially among followers of Sufism. In parts of North Africa, where blue is common, the shade of a turban can signify the tribe of the wearer. The Maratha Chattrapati Sambhaji, wearing a Turban, jeweled with gemstones. The Mughal Emperor Aurangzeb wearing a Turban and its ornaments. Sultan Mehmed II wearing a Turban. Mughal Emperor Babur and his heir Humayun wearing Turbans. Suleiman I wearing a large Turban. Selim II wearing the Ottoman imperial Turban. 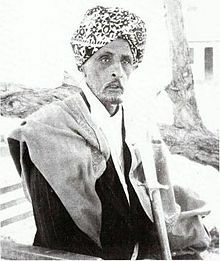 Somali Sultan Mohamoud Ali Shire of the Warsangali Sultanate wearing a turban. Contemporary turbans come in many shapes, sizes and colours. Turban wearers in North Africa, the Horn of Africa, the Middle East, Central Asia, South Asia, and Philippines (Sulu) usually wind it anew for each wearing, using long strips of cloth. The cloth is usually under five meters in length. Some elaborate South Asian turbans may also be permanently formed and sewn to a foundation. Turbans can be very large or quite modest depending upon region, culture, and religion. Traditionally, turban has been the name of a type of headwear worn by women in Western countries. The wearing of such turbans by women in Western societies is less common than it was earlier in the 20th century. They are usually sewn to a foundation, so that they can be donned or removed easily. Turbans are commonly worn in the Horn of Africa by Muslim clerics, as well as Ethiopian Orthodox Christian priests. The headwrap has a long presence in the region, where it was frequently sported by Sultans, Wazirs, and other artistocratic and court officials. Among these nobles are the Somali Sultans Mohamoud Ali Shire of the Warsangali Sultanate, Osman Mahamuud of the Majeerteen Sultanate, and Yusuf Ali Kenadid and Ali Yusuf Kenadid of the Sultanate of Hobyo. Prominent historical Islamic leaders in the region that are known to have worn turbans include Sheikh Abadir Umar Ar-Rida. In most countries of the Arabian peninsula, a plain or checkered scarf (called keffiyeh, ghutrah, shumagh or chefiyah), not usually described as a turban is often worn, though the Arabic Emamah tradition remains strong in Oman (see Sultan Qaboos of Oman), Sudan and some parts of the Arabian peninsula. The colored turban, Ghabanah, is a common inherited cultural turban in the regions of Hijaz, and it still the inhabitants costume of Mecca, Madinah and Jeddah in particular. Ghabanah is the heritage uniform headwear for traders and the general community categories of the prestigious and middle-class, with the exception of religious scholars who have had their special turbans distinctiveness predominately white. The Hijazi turbans with different shapes are the extension of the turban of Islamic prophet Muhammad who lived in Mecca and Madinah. There are several types of Ghabanah, perhaps the most famous is the yellow (Halabi), that made in Aleppo, that characterized by different inscriptions, and wrapped on a dome-like hollow taqiyah or a Turkish fez or kalpak cap. Colorful turbans called Masar are the national headwear costume in Oman, and also are common in some regions in south of Yemen and Hadhramaut. Moreover, the white ghutrah or shumagh are commonly wrapped in Hamdaniyah style, which is also the shape of turbans in the United Arab Emirates. Turbans are part of the national dress in Afghanistan. They are used more widely here than elsewhere in the Muslim world, and are worn in a wide range of styles and colours. In the country's south-east, turbans are wrapped loosely and largely, whereas in Kabul the garment tends to be smaller and tighter. In traditional Afghan society, a related piece of extra cloth called a patu serves practical purposes, such as for wrapping oneself against the cold, to sit on, to tie up an animal or to carry water in the cap. Different ethnic groups in Afghanistan wear different lungees with different patterns, way of styling it, fabric, stripes, lengths and colouration. Males of all ethnic backgrounds generally avoid wearing bright-coloured turbans that draw attention to oneself and prefer wearing simple colors that are white, off white, gray, dark blue and black. In Bangladesh, the turban is known as pagri, or fagri in Chittagong and Sylhet. The pagri is worn by religious leaders and preachers of Islam. The most common colour worn is white, and generally it is the Sufis that wear green turbans. It is also worn by elders in rural areas as a symbol of honour and respect. In Myanmar, the turban is referred to as a gaung baung. There are several regional styles worn. In Malaysia, Sikhs wear turbans. Turbans are holy items to them. In India, the turban is referred to as a pagri, meaning the headdress that is worn by men and is manually tied. There are several styles, which are specific to the wearer's region or religion, and they vary in shape, size and colour. For example, the Mysore Peta, the Marathi pheta, Puneri Pagadi and the Sikh Dastar (see below). The pagri is a symbol of honour and respect everywhere it is worn. It is a common practice to honour important guests by offering them one to wear. Colours are often chosen to suit the occasion or circumstance: for example saffron, associated with valour or sacrifice (martyrdom), is worn during rallies; white, associated with peace, is worn by elders; and pink, associated with spring, is worn during that season or for marriage ceremonies. Navy blue is a color common more to the Sikh Nihangs, it signifies war and service, while black is associated with resistance, orange with martyrdom and white with old age, death, or peace; however during times of peace or rallies for peace people will usually be in war gear (i.e. blue) white only has the association. In Java, the turban-styled headdress for men is traditionally called iket. It literally means to tie, the main way to attach the fabric over the head of the wearer. It is made of a square or rectangular batik cloth that is folded diagonally to form a triangle. Although there are different ways of folding and tying the fabric over the head, and therefore different shapes of iket, they can in general show the social level of the wearer and the area of origin. Its origin is not yet clearly identified, however many sources seemed to conclude that the Javanese might be influenced by turban-wearing Gujarati traders who came to Indonesia more than 500 years ago. In East Java, the headdress is still made in traditional way and it is called udeng. In other parts of Java, for practicality the iket has developed into fixed-form headdresses, called blangkon in Central Java and bendo in West Java. The batik cloth is made stiff through a process of molding, attaching to stiff paper, and sewing. Similar to iket, blangkon and bendo come with some variations of shapes based on the areas of origin and the wearer's social rank. While turbans are frequently worn in the Muslim Middle East, they are also worn in Lebanon by both Muslims and Christians alike. Ordinary citizens mostly wear them on special occasions, whereas religious leaders wear them almost daily. Nepalese Sardar Bhakti Thapa, a Gorkhali nobleman wearing aristocratic white Shirpau turban. The turban in Nepal is commonly worn in rural areas by males. The rural turban is called either a Pagdi or Pheta. It is common among farmers. All types of coloured clothes were used for Pheta. Historically, Gorkhali nobleman used to wear white turban called Shirpau awarded by the King of Nepal. For example; Sardar Ram Krishna Kunwar was awarded with 22 pairs of headgear called Shirpau by the Gorkhali monarch Maharajadhiraj Prithvi Narayan Shah. It was common among aristocrats in other contemporary kingdoms. Rulers and vassal lords also adapted a crest to the white turban. 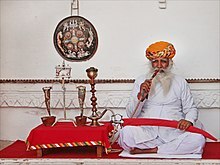 In Pakistan, the turban is in widespread use, especially among the rural population. It is worn in different styles and colours across the country, varying by region, e.g. in the north of the country, black and white turbans are preferred. The turban most commonly found in Pakistan is white and crestless, and worn commonly in the Pashtun belt, while in rural Punjab and Sindh, it is mostly worn by elders or in rural areas. The turban is called either a Pagri or Pag, while it's called Lungee by Pashtuns. The Baloch people are famous for their large turbans that are worn with both ends hanging from the sides or as a loop that rests above the chest. These turbans are made with many feet of cloth that are wrapped around a cap and are mostly made with white cloth. In the United Kingdom, turbans have been worn by men and women since the sixth century without ever becoming very common. Poet Alexander Pope is sometimes depicted wearing a turban, as were other notable men seen in contemporary paintings and illustrations. The common use of turbans on less formal occasions, among gentlemen at the time, reflects that their heads were closely cropped, or shaved, to allow the wearing of the elaborate wigs that were the fashion in Europe in the century from about 1650 to 1750, and when wigs were off, some kind of head cover was useful. Hence, the turban. Now that hats are infrequently worn, turbans too are relatively uncommon. They are worn primarily by women of West Indian descent, Karinas. Some women wear them to make a statement of individuality, such as the British social entrepreneur Camila Batmanghelidjh, who usually wears a colourful matching turban and robe. In Greece, specifically the island of Crete, the men traditionally wear a turban known as a sariki. The headwrap's name is borrowed from sarık, the Turkish word for turban. Today, it may be more commonly known as a kritiko mandili (Cretan kerchief). It is not found commonly amongst the younger generation, but mostly worn by older men in remoter, mountainous villages. iTaukei indigenous chiefs and priests were known to have worn masi (barkcloth) coverings around their head similar to a turban, called an i-sala. However, most of the bulk and shape of the i-sala came from the bushy hair under the cloth. On some Babuyan islands (Philippines) the head of the household wears a white turban, the younger males wear a red turban after their 13th birthday. The three chiefs all wear yellow turbans. It no longer has religious significance and the origin dates back to the end of the Tondo era (cira 900s – 1589) Most Babuyan settlers fled the Philippines in 1589 when Spain began to invade the Philippines. The turban was made from a type of bark cloth but now is made from cotton or silk brought over from the Philippines mainland. The turban style head dress is then cut and wrapped around the head, then tucked in front. Much of Armenia's traditions and cultures reflect Middle Eastern origins. Though not common in daily apparel, turbans are sometimes worn by men ceremonially (often with beards), as a symbol of national identity during celebrations and festivals. However, before Armenia became a Christian nation, turbans were a common part of the daily apparel, just as in other Middle Eastern countries. On the Swahili Coast, turbans were frequently worn by the ruling Omani Sultans of Zanzibar and their retinue. Tuareg Berbers, and some northern Berbers, Sahrawi, Songhai, Wodaabe, Fulani, and Hausa peoples of North and West Africa wear varieties of turbans. Tuareg Berbers often veil the face to block dust. This Tuareg-Berber turban is known as a tagelmust, and is often blue. The Bedouin tribes in North Africa sometimes wear brown-beige, white or orange turbans. Colombian politician Piedad Cordoba is known to wear turbans (or a similar headgear). Her use of turbans has made her so distinguishable to the point of having earned the nickname "the lady with the turban" in Colombian popular culture. Kurdish people wear a turban, which they call a jamadani. It is worn in many different ways across Iraqi Kurdistan depending on the style of the locality; e.g. the Barzani Kurds are a tribe which wears the turban in a colour (red and white) and style which is typical of their clan. In most parts of South Kurdistan a black-white pattern is used for Jamadani. Mostly, Kurdish turbans consist of a length of striped cloth known as kolāḡī which is wound around a conical hat; the tassels that border the kolāḡī are allowed to hang down over the face. In modern times, many Kurds use black and white Ghutra and roll them into turbans. A Christian mukurinu (singular form of akurinu) on the Swahili Coast wearing a turban. In Kenya, the Akurinu, a Christian denomination, wear turbans as religious headgear. The official name of the denomination is The Kenya Foundation Of The Prophets Church or else Holy Ghost Church. Both men and women wear white turbans; children wear tunics. 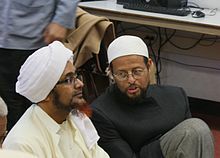 Habib Umar bin Hafiz (left) of Yemen wearing a white turban. In Islamic cultures, some men wear a turban-style headdress in emulation of Muhammad who is believed to have worn a black or white turban. In Islam, the turban is a Sunnah Mu'akkadah (Confirmed Tradition). The head wraps are worn in different ways and called by different names depending on the region and culture. Examples include (Arabic: عمامة‎ `emãmah) in Arabic, (Persian: دستار‎) in Persian. In Shi'a Islam, a black head wrap around a small white cap is worn by descendants of Muhammad called Sayyids, and white turbans by other well-educated persons and scholars. Sufi Muslims often wear a green head wrap around a small cap or the green head wrap alone. In Sudan, large white headdresses connote high social status. In Pakistan the cap is called a topi. Women of Islam do not wear turbans, as it is considered part of a man's dress, while women do cover their hair as part of hijab. In the Ottoman Empire, Muhammad's numerous descendants formed a kind of nobility with the privilege of wearing green turbans. A Georgian Muslim imam from Tbilisi wearing a turban. When the Jewish High Priest served in the Tabernacle and the Temple in Jerusalem, he wore a head covering called mitznefet מִצְנֶפֶת. This word has been translated as mitre (KJV) or headdress. It was most likely a turban, as the word comes from a root meaning 'to wrap'. In the Hebrew Bible, the turban worn by the High Priest was much larger than the head coverings of the priests and wound to make a broad, flat-topped shape resembling the blossom of a flower. The head covering of the priests was different, being wound to form a cone, called a migbahat. The priestly crown (Hebrew tzitz צִיץ "blossom", "flower") was attached to the turban by means of two sets of blue cords: one going over the top of the head and the other around the sides of the head at the level of the ears (Exodus 39:31). According to the Talmud, the wearing of the turban atoned for the sin of haughtiness on the part of the Children of Israel (B. Zevachim 88b). Members of the Bobo Shanti mansion of the Rastafari movement keep their hair and beards, mainly with their hair in dreadlocks, and they have been wearing turbans over their dreadlocks, which are not to be removed publicly or even not at all, so as to protect and keep their dreadlocks clean. Along with the turban, they have also been wearing robes since their founding in the 1950s, Since they are a relatively small population, it makes them more distinctive in appearance in Jamaica and elsewhere. The Sikh turban, known as the Dastar or a Dumalla or a "Pagg" (cultural name), is used to show others that they represent the embodiment of Sikh teachings, the love of the Guru and dogma to do good deeds. The main reason Sikhs wear the turban is that it is a way for anyone in society, regardless of religion, race, caste etc to easily identify a Sikh, man or woman, so that if an individual were in danger or needing help, they could easily spot a fellow Sikh in a crowd, whose duty it would be to help save and protect them. The Gurus ensured that both men and women are able to wear a turban, which shows another action of equality. Other Purposes of the turban include protecting Sikhs' long unshorn hair and keeping it clean. The wearing of the turban is mandatory for all members of Khalsa (Initiated Sikhs). The Rajastani turban is also commonly called the pagari (in the West, many Sikhs who wear pagri are sometimes mistaken for Muslims or Arabs.). Akali turban cotton over a wicker frame, steel overlaid with gold. Lahore Mid-19th century, "A tall conical turban provided convenient transportation for a number of sharp steel quoits – edged weapons hurled to lethal effect by the practised hand of the Akalis." All Sikh Gurus since Guru Nanak have worn turbans. Some reasons Sikhs wear the turban are to take care of the hair, promote equality, and preserve the Sikh identity. Sikh women may wear a turban if they wish. Sikhs do not cut their hair, as a religious observance. The turban protects the hair and keeps it clean. As Sikhs only form 2% of India's population, their turbans help identify them. When he institutionalized the turban as a part of the Sikh identity, Guru Gobind Singh said, "My Sikh will be recognized among millions." Turbans were formerly associated with the upper class, and many men in the cultural elite still wear turbans. This distinction between the turban-wearing upper class (Sardars) and commoners promoted segregation and elitism. In order to eliminate the class system associated with turbans, Guru Gobind Singh Ji declared each and every Sikh a Sardar. He also rejected the caste system by giving all Sikhs the last names Singh (Lion) or Kaur (Princess). Modern Sikh men mainly wear four kinds of Turban. Morni Turban, Patiala Shahi Turban, Vattan Wali Turban and Amritsar Shahi Turban. The Dumalla style is more traditional and can be recognized by its horizontal wraps, versus the peaked wraps as seen in the aforementioned styles. The Dumalla is becoming more popular among Sikh youth (men and women). The Dastar Bunga is the style of turban generally worn by Akali Singhs in battle. The "Chand Tora" is a metal symbol consisting of a crescent and a double edged sword, held in place at the front of the turban by a woven chainmail cord tied in a pattern within the turban to protect the head from slashing weapons. The purpose of the Tora is to keep the dastaar together. It goes over the bunga (inner turban) to protect it. It is also used for keeping shastars (small weapons) in place. The most common turban colors worn by Sikhs are blue, white and black, although other colors are very popular as well. Orange and yellow are particularly prestigious and tend to be worn on religious events such as Vaisakhi. Meanings of the turbans are that the white turban means a saintly person leading an exemplary life, and an off-shade color of white means someone is learning in the Sikh religion. The blue turban signifies a mind as broad as the sky with no place for prejudice. The black turban is a reminder of the British persecution of the Sikhs in 1919, and represents humility. The orange turban is representative of courage, and wisdom. Royal blue is usually worn by those who are learned in the Sikh religion. Akali Nihang Sikhs decorate their turbans or Dumalla by wearing small weapons known as shastars in them. 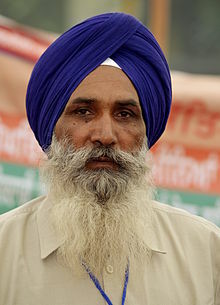 The turban's color may reflect association with a particular group of Sikhs, although none of the popular turban colors are exclusive to any particular group. Turban colors are generally a matter of personal choice in Sikhism, with many Sikh men choosing colors based on fashion or taste, sometimes to match clothes. There are traditions associated with some colours, for instance orange and black are often worn at political protest rallies whilst red and pink turbans are worn at weddings and other celebratory events. Zail Singh, the former President of India. Jagmeet Singh, the leader of the New Democratic Party of Canada, wearing a basic Dumalla. Manmohan Singh, the former Prime Minister of India. Bikram Singh, former Chairman of the Chiefs of Staff Committee of India. Fauja Singh, a centenarian marathon runner. Diljit Dosanjh, an actor, singer, television presenter and social media celebrity. Young Sikh man wearing Patiala Shahi Pagg. ^ "Turbans Facts, information, pictures | Encyclopedia.com articles about Turbans". www.encyclopedia.com. Retrieved 2016-04-19. ^ "Do Sikh women have to wear a Turban (Dastaar) as well as men? | Sikh Answers". www.sikhanswers.com. Retrieved 2016-04-19. ^ a b Haddad, Sh. G. F. "The turban tradition in Islam". Living Islam. Retrieved 5 August 2013. ^ "Alternative Wig Idea: Cover Hair Loss With a Cute Cap Instead". About.com Health. Retrieved 2016-04-19. ^ "P. Ovidius Naso, Metamorphoses,Book 11, line 146". www.perseus.tufts.edu. Retrieved 21 January 2017. ^ Goldman, Norma; Nyenhuis, Jacob E. (1 January 1982). "Latin Via Ovid: A First Course". Wayne State University Press. Retrieved 21 January 2017. ^ D'Amato, Raffaele (10 August 2005). "Roman Military Clothing (3): AD 400–640". Bloomsbury USA. Retrieved 21 January 2017. ^ Condra, Jill (1 January 2008). "The Greenwood Encyclopedia of Clothing Through World History: 1801 to the present". Greenwood Publishing Group. Retrieved 21 January 2017. ^ Hughes, Thomas Patrick. A Dictionary of Islam: Being a Cyclopedia of the Doctrines, Rites, Ceremonies and Customs Together with the Technical and Theological Terms of the Muhammadan Religion. WH Allen & Company, 1895. ^ Hamal, Lakshman B. (1995). Military history of Nepal. Sharda Pustak Mandir. p. 125. OCLC 32779233. ^ Me, Rondo B. B. (2004). Fiji Masi: An Ancient Art in the New Millennium. Burleigh Heads: Catherine Spicer and Rondo B.B. Me. p. 40. ISBN 978-0-646-43762-0. ^ Cochrane, Susan; Quanchi, Max, eds. (2014). Hunting the Collectors: Pacific Collections in Australian Museums, Art Galleries and Archives. Cambridge: Cambridge Scholars Publishing. p. 58. ISBN 978-1-4438-7100-6. ^ Rubin, Alyssa J. (15 October 2011). "Afghan Symbol of Identity Is Subject to Search". New York Times. Retrieved 16 October 2011. ^ Inter Islam. "The turban, topee and kurta – in the light of Ahadith and the practice of our pious predecessors". inter-islam.org. Retrieved 2014-02-10. ^ "Islamic Dress and Head-dress for men". sunnah.org. Retrieved 2014-02-10. ^ "SeekersGuidance – Can Anyone Wear a Turban? Are There Styles Specific for Scholars? – Answers". seekersguidance.org. Retrieved 2014-02-10. ^ "ROOTS RASTA RUNWAY". Archived from the original on 2008-12-11. Retrieved 2010-03-03. ^ "BBC – Religions – Rastafari: Bobo Shanti". ^ Sidhu, Dawinder (2009). Civil Rights in Wartime: The Post-9/11 Sikh Experience. Ashgate Publishing, Ltd. p. 48. ISBN 9781409496915. ^ "design: The Orange Turban And Their Importance". testa0.blogspot.ca. Retrieved 2016-03-04. ^ "Why Do Sikhs Wear Turbans?". About.com Religion & Spirituality. Retrieved 2016-03-04. ^ "Significance of color/colour of turban/pug/pag/dastaar/pagri/pagree in Sikhism". www.sikhwomen.com. Retrieved 2016-03-04.